I thought, with all the new talent, new editing techniques and preview audiences that there was no chance that this movie could be THAT bad. 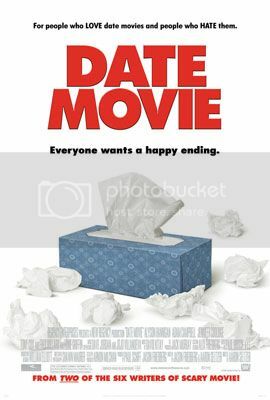 I never realized how unbelievebly crappy Date Movie was until i got to see it myself. 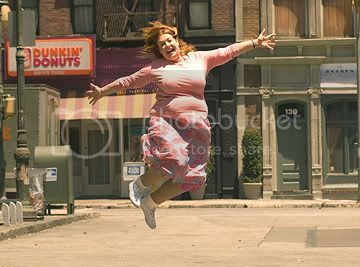 Julia Jones (Alyson Hannigan) is fat. She gets help from a midget version of Hitch to get her to woo the man of her dreams.....heck, this doesnt even deserve a synopsis. The jokes were ill timed and stale. The actors weren't even funny. Don't get me wrong, I love campy parody movies. I love the Airplane! and Naked Gun movies (the Scary Movie series....not so much), I just throught that this would be at least sub-par to what theese movies were like. But you know what ...I was wrong. Do yourself a favor, go get your 80 bucks somewhere else. If you happen to catch yourself in the theater seat watching Adam Campbell do his Meg Ryan impression at around 5:30pm (like I unfortunately did), get out of the theater, go straight home, becaouse you might miss the first few songs in American Idol. I couldnt give it less than 1. I'm glad I saw this movie for free, because I would not dish out $2 to see it. The acting is horrible and the parodies of the other movies are not done well. I don't think I laughed more than twice the entire movie, and even those were small chuckles. The soundtrack used in the movie is comprised of simply played out songs that have appeared in many movies already.